On the face of it, the nightmarish struggles of a young woman diagnosed with paranoid schizophrenia may seem to be unlikely material for musical theater, let alone an opera. 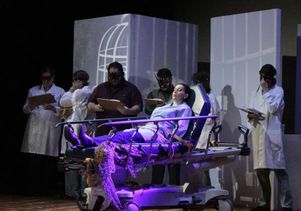 But for UCLA psychiatrist and occasional opera composer Dr. Kenneth Wells, it was the perfect inspiration for his second opera, “The Center Cannot Hold,” which opens tonight at the Louis Jolyon West Auditorium, with additional performances July 10 and 16. 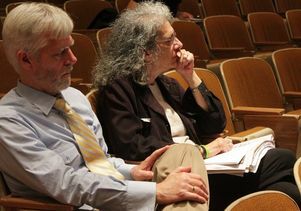 Dr. Kenneth Wells and Dr. Elyn Saks watch a dress rehearsal of Wells' opera about her struggles with schizophrenia. She served as co-librettist. “The Center Cannot Hold” tells the story of Dr. Elyn Saks, a USC professor of law and psychiatry, who began having schizophrenic episodes in high school and spiraled into the depths of the illness when she was a student at Yale Law School. Based on her 2007 memoir of the same name, the opera follows Saks during a pivotal time at Yale as she ultimately faces her demons and resolves to live her life as fully as she can, whatever it takes. “I'm attracted to turning points,” says Wells, who teaches human behavior at UCLA's David Geffen School of Medicine and is director of the Center for Health Services and Society at the UCLA Semel Institute for Neuroscience and Human Behavior. Wells is also affiliated with the RAND Corporation. “There are moments in our lives that give us insight, strengthen us and put us on the road to better days. As a psychiatrist and a musician, I am fascinated by the process,” he says. Wells' musicianship, like his medical training, has deep roots. His family boasts “multiple generations steeped in both music and the sciences,” says the psychiatrist, whose great aunt, Ruth Wells, was the first woman thoracic surgeon in the U.S. and only the second woman to graduate from Stanford Medical School. Wells’ grandfather was a vice president at Bell Telephone. His father worked as an electrician for major TV and radio studios. And everybody sang. He vividly remembers holiday gatherings where the entire brood would gleefully engage in 16-part harmony. “Nobody wanted to sing the main melody,” he says, laughing. Playing an old, giant organ, the young Wells composed little melodies he'd give to schoolmates as gifts. A high school friend sparked his interest in opera, but Wells found many of the themes troubling. His first opera tried to do just that. “The First Lady,” which was staged at UCLA in 2010, was a semi-fictional portrayal of Eleanor Roosevelt as she struggled with the shock of her husband's death and feelings of betrayal after she learned about FDR's longtime affair. “I spent 20 years working on “The First Lady,” Wells says. “But writing “The Center Cannot Hold” took only two. So I guess I'm getting better.” Plus, this time he had the advantage of a primary source: Saks is his co-librettist. They've been friends ever since Saks took a class taught by Wells' wife, psychiatrist M. Christina Benson. Saks also participated in a panel discussion that accompanied the production of “The First Lady.” That's when they started talking about working together. Wells admired Saks' courage in going public about her condition. Saks admired Wells' talent and sheer capacity. Their friendship made it easier for Saks to consider revisiting her darkest moments: the delusions and hallucinations. Climbing onto the Yale library rooftop at midnight and singing at the top of her lungs. Asking a professor for permission to trash his office. Spending month after month in hospitals, immobilized by restraints. It may be a tall order to expect an opera to illuminate the essence of schizophrenia, where “your personality isn't 'split.' It's shattered,” Saks explains. But she overcame her personal challenges and is now a happily married, respected professor with many friends and colleagues, as well as a MacArthur Foundation “genius” grant winner. Both she and Wells see the opera ultimately as a story of hope and triumph. While the performances are sold out, a waitlist is available here.